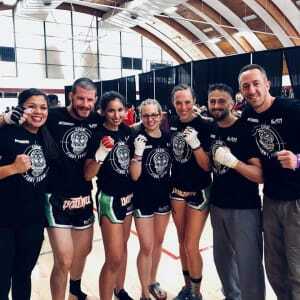 We recently had 5 of our upper level Krav Maga students take part in a regional Muay Thai tournament. Our team had a great showing, winning 2 gold medals and 1 silver medal! You may be asking, "Why are Krav Maga students taking part in a sports fighting tournament? ", which is a really good question! We are definitely not a combat sports fighting school, nor do we have a combat sports program. Our passions as instructors rest solely on the self defense side of things. The "Why" is due to what we as self defense practitioners can gain from the experience. The Krav Maga organization that we are affiliated with (Krav Maga Alliance) has a requirement called the Fight Requirement. This is that anyone wishing to qualify for the rank of Black Belt, in addition to passing the Black Belt test, must participate in a ring fight. Now this "ring fight" can take many different forms and there are a few ways to accomplish it, but the gist is that you face someone that you don't know with people watching. It is, of course, a physical event, but the real self defense relatable part is the mental aspect of it. It's a huge test of the ability to face your fears and perform under stress. Fortunately, it is not 100% foreign movements, as Krav Maga already utilizes techniques from some combat sports. Imi Lichtenfeld, who created Krav Maga, was a champion boxer and wrestler who was forced to adapt and modify his skills when his battleground became the streets of his neighborhood instead of the rings. Because of this history, we separate out and focus on some of the inherent sport influenced components of Krav Maga as we want to be very well rounded. But while many of the movements may be familiar, the rules/strategy/purpose is not so much. This is also definitely not about any type of matchup pitting Krav Maga vs another style. We are playing by their rules in their sport. The 5 who recently fought selected this tournament using Muay Thai rules as their means of satisfying this Black Belt Fight Requirement. We all couldn't be more proud of the group that took part in the tournament. They faced their fears and learned so much more of what they are capable. Our ultimate goal has nothing to do with winning or losing these fights as we have a bigger purpose and accomplishment, but they put in so much work to be in a position to do their best and peform as well as they did.